Companies with an established web presence must consider a mobile presence; this means having mobile apps that interact with its’ primary services. All major social media services have invested significantly to boost mobile accessibility. It was forced on them. Their monthly active users already consume services on mobile devices on par with computers; in the future, mobile usage dwarfs computer usage. Just consider, IBM recently made a whopping four billion dollar investment in cloud and mobile computing. How much time does it take to complete the task? Does it require focused attention? With Twitter, it is easier to view Tweets and respond to others from the app; in fact, for many, it is a requirement to be active on Twitter all day long. When you are running campaigns and researching what you are going to broadcast on a given day, it is easier to use web services. Who is consuming the service? Are they likely using a mobile phone, tablet, laptop, or computer? When are they accessing the content – before, during, or after work? Where are they – in the car, at their desk, or at home? Facebook – popularized by the younger generation – is an important communication platform. For the older generation, it is a source of recent news. Users access Facebook via their smartphone whenever there is a break in the day. What content is used? Is it memory intensive? Does it require a lot of processing? What is the optimal screen size to view the content? LinkedIn comes to mind. Conducting advanced searches and reviewing many profiles in a sitting is easier to accomplish through its web service, but it is easier to send quick messages, make connections, and check updates on its app. There are three strategies to establish a mobile presence. First, create your own set of apps that run on the three main platforms – Mac IOS, Windows 8, and Google Android. Second, provide API access, so third-party developers create mobile apps based on your service. Third, make your website mobile friendly – having it responsive or delivering content in a different way; all mobile devices have browsers. There is always a place for a standard computer. Much of the content we consume requires a larger screen, better processing power, and faster memory access. There are tasks like programming, writing, editing videos or graphics, playing graphic intensive games, and analyzing or modeling statistics that you do predominately on a computer. Apps are becoming a staple of future generations. (People label Generation Y as digital natives, I label Generation Z as mobile natives.) Apps probably become more prevalent than websites in many things, though websites will always have its place. 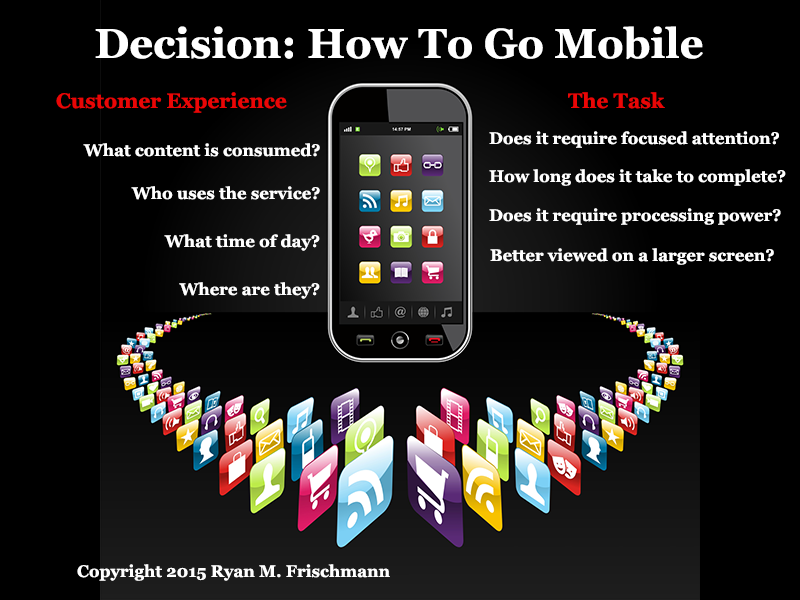 In going mobile, companies need to breakdown things down into tasking – when, where, and how content is consumed. Previous Previous post: What’s the Rush in Putting up a Personal Website?